Explore the jungle and reach the finish without taking any damage. Free all birds, deal with enemies and collect diamonds. Get three stars for each level and enjoy the game! 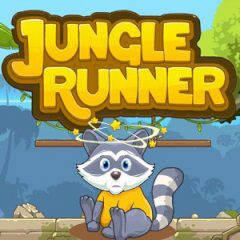 Lead a cute raccoon through the jungle and reach the finish, dodging the obstacles on your way and collecting diamonds. Open the cages to free the birds and gain extra stars for completing additional tasks. Collect diamonds, jump over the obstacles and keep the character unharmed to get three stars in the end of the level.